A young Orpheus has discovered the laurel grove where Daphne, a river naiad, was transformed into a laurel tree to escape Apollo’s advances. 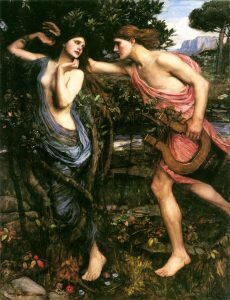 Thinking to pluck a bough for luck, Orpheus learns that Daphne is still present, and not willing to confer a blessing on those who simply take what they want. Orpheus accepts correction, and asks Daphne to speak her truth. Her stern wisdom changes his outlook and converts him from an ambitious follower of fame to a patient student of nature. This musically charming opera miniature conveys powerful truths about sexual assault and consent, religious corruption, and the relationship between civilization and the environment. for mezzo-soprano, baritone, flute, oboe, guitar, and tambourine.